Many congratulations to Masie Williams a Year 10 student at Ysgol Treffynnon who recently achieved North East Wales Representative Honours for Netball. 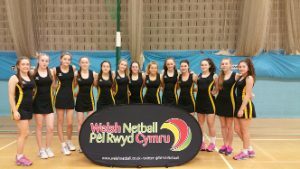 Maisie travelled to Cardiff with the rest of the selected team on Friday the 19th of January to represent North East Wales in a Netball National Tournament against different regions across Wales, after having gone through a trial process to be selected for the team. The tournament took place on Saturday 21st January, with Maisie being selected to play for the A Team who were placed 3rd out of 7 teams. Maisie really enjoyed playing and spending the weekend in Cardiff.